Please note that as of 21 April 2008 the Lewis Windfarm is not relevant having been refused planning consent by the Scottish Ministers. Renewables on Lewis is a complex and often unattractive story. Information is hard to come by as developers seek to protect 'commercial confidentiality' at the expense of environmental integrity and the long-term interests of local communities. They are driven by the high profits available to privatised companies under the Renewables Obligation schemes. As these disproportionately reward early birds in the ‘renewables’ sector, there is considerable commercial pressure to truncate the environmental assessment process. There is no doubt that politicians of all shades are improperly uncritical of what is a powerful lobby, dominated by giants of the European nuclear industry. This is nowhere more true than on Lewis. Far from contributing to 'sustainable development' the big Isle of Lewis windfarms provide a striking example of the 'green dream gone bad' and an opportunity to highlight the powerful public relations hype which is used to obscure the real impacts of the industrialisation of some of the UK's last remaining 'wilderness' areas. The following provides a summary of some of the issues - more detail can be found on other pages. Should they gain consent, the windfarm planning applications currently under consideration would see turbines, roads, quarries, transmission lines and other infrastructure stretching almost continuously for around 40 miles across the Lewis moorland (see 'Lewis Windfarm Map'). The distance adjacent to Lewis roads would be even longer as the windfarms will stretch from Ness in the north down to Bragar, accross Barvas Moor to Stornoway and then down to the Harris border in the south. 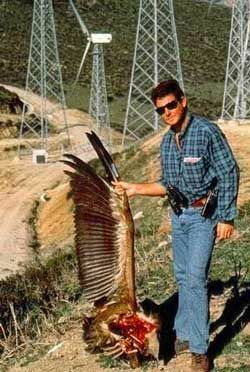 threaten internationally important populations of Golden Eagles, White-tailed Sea Eagles and Black-throated Divers. Throughout the three sites, windfarm infrastructure will cause irrevocable damage to EU protected peatland habitats, which are a natural carbon store. Internationally, wetland organisations are now lobbying for a dedicated global finance mechanism for the protection and restoration of peatlands as an urgent priority in the package of climate change actions (see: http://www.wetlands.org/). In the case of the Lewis Wind Farm and Pairc Windfarm the developments are to be situated on land currently held under crofting tenure by hundreds of Lewis residents. In order for the windfarms to proceed, the developers will have to gain possession of the land they require for infrastructure. 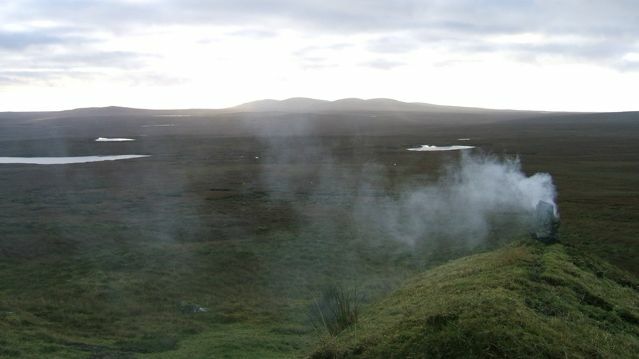 Although crofting law allows for land to be taken out of crofting, or 'resumed' amicably where it can be seen that it is in the interests of the crofting community, already over 730 Lewis crofters have formally indicated that they will fight any attempt by the landlords and developers to dispossess them of their land. Under these circumstances the developers will have no recourse but to try and force through the resumption process against the wishes of the community. Opposition to the proposals has been unprecedented. Over 16,000 objections have been submitted so far, and across the islands, out of 26 measures of public opinion ranging from village ballots to MORI polls not one has recorded majority support. In contrast to the position of the previous government who refused to recognise the strength of opposition to the Lewis proposals, the new Scottish Parliament has acknowledged that public opinion is a material consideration that will be included in their deliberations. The Saudi Arabia of Renewable Energy? Promoters of the major onshore windfarms on the Lewis frequently refer to the 'massive renewable resource' on the islands, the implication being that developing the Western Isles is an opportunity not to be missed if we are to fight climate change. In fact in respect of onshore windfarms although the Western Isles are inarguably windy, this is only relative to other UK locations. In 2005, a study looking at the actual electricity produced by windfarms in the UK found that the average load factor for windfarms accross the UK was 28.4% i.e they were only producing 28.4% of their potential output. On mainland Scotland average load factors ranged between 31.5% and 33% (1). Against this, the windfarm developers on Lewis claim load factors up to 35% which, although slightly higher than average, will make a negligible difference to reducing green house gas (GHG) emmissions either nationally or globally. It will however further swell the enormous profits to be made by the developers which will run into many hundreds of millions of pounds. Although onshore wind currently dominates development proposals, the Western Isles also have great potential for marine based energy, particularly wave generation. However some argue that this resource will not be exploited unless the windfarms are built and trigger the major transmission system upgrade required if the islands are to become an exporter of large quantities of electricity. This does not follow, as under the current regulatory regime, transmission infrastructure is built on the basis of private connection agreements made between the generator and the transmission system operator, subject to planning consents. Accordingly the most advanced proposals for a transmission upgrade, the 600MW Lewis-Ullapool-Beauly line is being progressed by the transmission company SHETL, part of the SSE PLC group, to service their own 205MW Pairc Windfarm and the neighbouring Beinn Mhor Power Ltd, Muaitheabhal Windfarm on the Pairc Peninsula, together having grid agreements totaling 550MW. The remaining 50MW on the 600MW cable will cater for small local projects. It is unlikely that the capacity of this transmission line could be increased due to constraints further into the grid, and so any alternative generation technology would only be able to access this line after the windfarms shut down. Lewis Wind Power, who do not have a grid agreement and so have no means of getting their power off the island even if they obtain planning consent, are now competing against SHETL to build their own cable, possibly to Hunterston (run by LWP partner British Energy) or even further south, which will bypass constraints in the north. It seems unlikely that OFGEM, the electricity regulator, will allow both to be constructed, as estimated costs for the preferred routes, (which will be passed onto consumers), range from around £300 million to over £600 million depending on the technology used. Whatever the outcome, it is clear that for the foreseeable future the renewable energy resources of the Western Isles are now in the hands of large Utilities and private companies. "The best place to put a windfarm in Wales is Lewis (Scotland)"
"During the lifetime of the wind farm these figures will be reduced slightly as wind displaces gas fired generation , which produces lower Green House Gas emissions than coal fired plant." This statement is completely misleading as already electricity in the UK is generated using a variety of technologies including coal, gas, nuclear, landfill gas, hydro etc. In fact the Carbon Trust, DEFRA, DTI, OFGEM, Advertising Standards Authority and many other bodies all accept an emmissions rate for the generation mix of 0.43 tonnes of per megawatt hour - exactly half the figure used by Lewis Wind Power. Energy Minister Mike O'brien confirmed that it should also be applied to savings from windfarms in 2005. Accordingly, based on the generation-mix and adding emmissions resulting from back-up required for when wind speeds are unsuitable, the potential CO2 emissions savings from the three windfarms could be in the region of 817,380 tonnes of CO2 per year,(approximately half that claimed by Lewis Wind Power for their windfarm), before transmission losses and CO2 released from disturbed peat are taken into account. By comparison a single jumbo jet travelling between London and Disneyland emits the equivalent of 520,000 tonnes of CO2 per year. The Lewis Windfarms will offset the equivalent emissions from 1.6 transatlantic jumbo jets. In this context it can be seen that the massive Lewis windfarms will make an insignificant contribution to UK energy generation or to reducing global carbon emmissions, particularly when so little is being done elsewhere to develop energy efficiency and decrease consumption and emissions generally. "There is too much careless talk about doing our bit, with the assumption that 'every little helps'. That isn't really true. Greenhouse gas emissions are at the front of everyone's minds, but you can't begin to address this matter until you see the UK's potential contribution in perspective. We contribute about 2% of global emissions at present, a proportion that is falling as the economies of China and India for example grow. At present China is about 4-5 times the size of the UK electrically, generating about 1800TWh, as compared to the UK's output of 390TWh. One Chinese government source estimates that by 2020 they will need 11 000TWh from a portfolio of 2400GW [generating plant], predominantly from coal fired stations (see fig 1). The UK currently has about 78GW of plant. Even the conservative estimates, such as that of the International Energy Agency (IEA), suggest that China will need 7600TWh in 2030 from a portfolio of 1500GW, with nearly 80% of that coming from coal because it is cheap and abundant. Against this daunting background it's clear that that UK can only hope to make a qualitative rather than quantitative contribution."